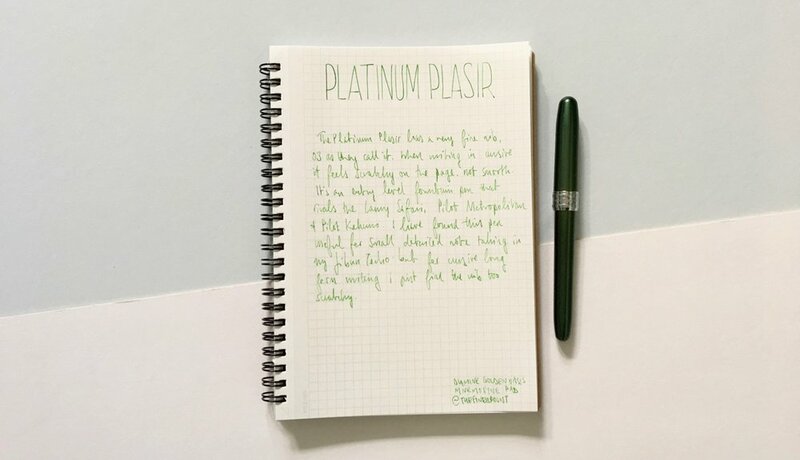 The Platinum Plasir was sent to me to review on the blog by Executive Pens Direct. The thoughts on this fountain pen outlined in my review below are not influenced by this in any way, it contains my honest views and opinions. The Platinum Plasir is an entry level fountain pen that comes in at less than £15 putting it in the same league as the Lamy Safari, the Pilot Metropolitan and Kakuno and edging towards the TWSBI Eco. The Platinum Plasir is not a fountain pen you often see included in top entry level fountain pen lists and I think there is a good reason. 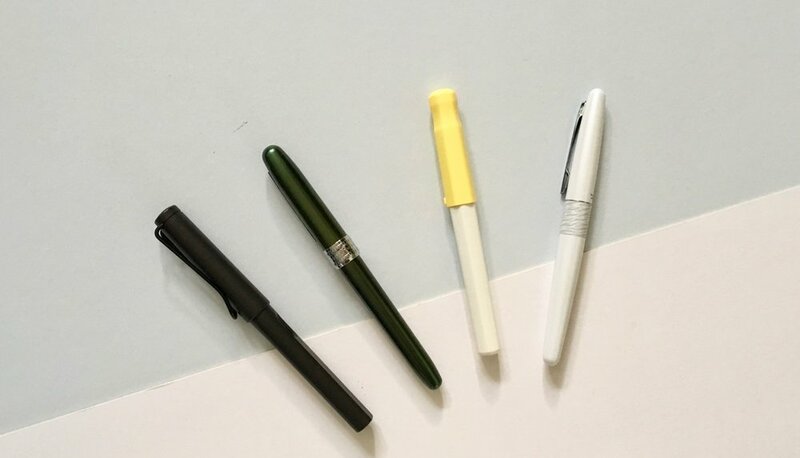 The Platinum Plasir lined-up against other entry level fountain pens, the Lamy Safari, The Pilot Kakuno and Pilot Metropolitan. The Plasir is comparable in length to a Lamy Safari, it's large-ish body looks a little imposing. It has a metal finish with chrome trim round the pen cap and on the clip giving the illusion of a fancy pen. The chrome around the pen cap is really fat and bulky and feels like it overpowers the pen. A slimmer design would have been much nicer. Like a lot of other entry level fountain pens the Plasir comes in a range of colours. I have the green which I really like. The dark green colour makes this a little understated but still gives the pen a little flair. The nib is where this pen gets really ugly. The nib matches the colour of the pen body, however not exactly so mine has a luminous green nib which feels like it clashes. The nib also looks very basic. When you look at this against other entry level fountain pen nibs, the Plasir is by far the ugliest. 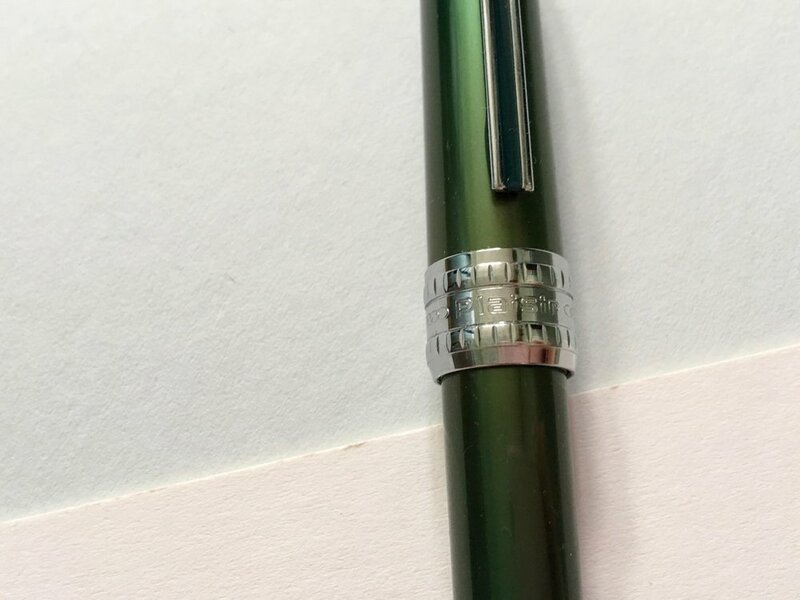 The luminous green nib and the clear plastic grip section. The grip section is plastic and transparent allowing you to see the ink moving up the feed which for a beginner is a nice feature. I have mine inked up with Diamine Golden Oasis Shimmer Ink and you can see that coming through nicely, (including a build up of the gold flecks). The reason why shimmer ink shouldn't be kept in a fountain pen. There is a slight rattle and noise when handling the pen when posted. I cant figure out if this is coming from the clip, whether something in there is a little loose but it's not a noise that evokes a lot of confidence. Using the pen is a little different, as you can tell I am not wowed by the design itself, but my faults and criticisms aren't deal breakers, they are just personal preferences. Using the pen improves things a little. The nib I have on my Plasir is a 03. The fact that Platinum use this kind of grading system suggests they are appealing the gel pen users and trying to get them to make the leap into fountain pens. In real terms a 03 is like a fine point fountain pen and as this is a Japanese brand then it truly is a fine. I have enjoyed using this fountain pen with my Jibun Techo where a fine point is definitely required for the space given. The nib is hard, there is very little give and flex but again I think that is a conscious decision. I have at times also found it scary when writing in cursive, for printing the Plasir has worked far better. This fountain pen also comes with a converter which means you can use whatever ink you'd like with it. This is a big bonus for those users wishing to branch out, or simply not be limited to standard cartridges. Looking at the Plasir alone it's not a bad fountain pen. There are definite plus points, the look of a superior quality pen, the choice of colours all work in its favour. But if you're looking for the first step into the world of fountain pens I wouldn't start here. I would still consider the alternatives, Lamy Safari or AL Star, the Pilot Metropolitan is a very similar pen and far superior to the Plasir. The Plasir is a great additional pen. There is nothing specifically wrong with it but I didn't find myself reaching for it and using it non-stop. If I wanted to get a friend into fountain pens I simply wouldn't start with the Plasir because I don't think it gives the best first impression. Introduce and use this fountain pen later on, but definitely don't start here. I'd like to thank Executive Pens Direct for sending me this pen to review on the blog.